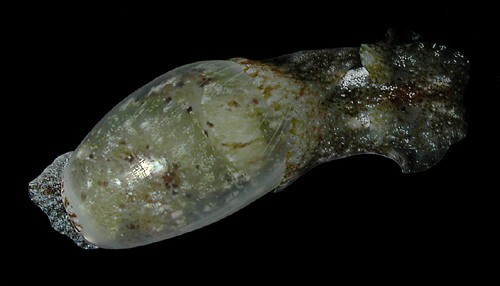 Maximum size: 12 mm (extrapolated from shell length). Identification: This species has a transparent shell with faint, wavy spiral striae. There is a prominent tooth on the columella and the outer lip may be slightly thickened in mature shells. The animal is translucent olive to light brown flecked with dark brown, dark olive and white. A band of dark flecks usually runs between the eye spots. Natural history: Diniatys dentifer is one of the most common haminoeids in Hawaii. It can be found both in rocky habitats and Halimeda kanaloana beds at depths of < 1 to 29 m (< 3 to 95 ft). It occurs in protected to highly exposed sites. It probably feeds on the blue-green algae Lygbya (on which it is often found in the field) and lays a spherical, pale pink egg mass. The egg mass is anchored in algal turf in the field and the eggs hatch in about three days in the laboratory. Distribution: Big Island, Maui, Molokai, Oahu, French Frigate Shoals and Midway: widely distributed in the Indo-Pacific. Taxonomic notes: This species is illustrated in Severns, 20ll as #5 on plate 189 (mislabeled as Mimatys sp. in the caption--caption switched with #4 on plate). Dinia compitorum Pilsbry, 1921 is a synonym (Kay, 1979) and it is listed under that name in Edmondson, 1946. It was probably first reported from Hawaii in Pilsbry, 1921. Photo: CP: 11 mm: Hekili Point, Maui; Nov. 27, 2003.